Sylvie Casper started her business, Top Quality Window Treatments in 1996 and she focuses primarily on soft treatments such as the one featured below. She also sells hard window treatments as well as upholstery and small slipcover projects. She lives above her studio where she works and primarily deals with retail, but occasionally works with designers on jobs after they provide color consultations. This particular job was installed just a few days ago. Her customer wanted to find a fabric to match her existing kitchen and granite countertops that did not block out the light from the transom windows. 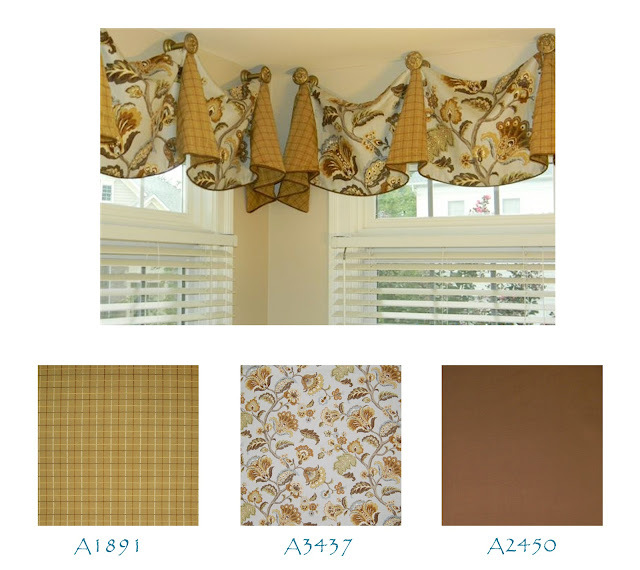 After considering these factors, she fell in love with the A3437 Horizon fabric and then chose a contrasting pattern, A1891 Amber, for the horns. The piping is done in the A2450 Bronze. If you have done a job that you would like to be featured on our blog, please let us know by e-mailing us at Matt@greenhousefabrics.com. Basic knowledge on window treatment in essential to enable you deal with all the windows! However this article is to enlighten you on the major advantages of choosing blinds over all the other types of window treatments. Thanks for sharing.